The Cost of a two-sided banner is $350.00. The Banners will hang in the Frank R. Williams Activity Center. CCAA will now be sending out mass mailings using postal service bulk mail. Any classes that would like to use this service for sending out newsletters or announcements, may coordinate with CCAA for the reduced rate – 25 cents per piece. Contact Frank Jones if you would like to take advantage of this money saving service. Next date for submission of newsletter articles: MARCH 1ST for the July 2010 newsletter. Send to: kelbro@earthlink.net Attn: Marcus Brown. 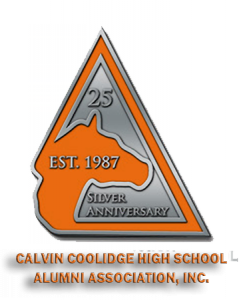 Calvin Coolidge Alumni Association Inc.'s Chair(C) and Co-Chairs (Co). PUBLIC RELATIONS/COMMUNICATIONS COMMITTEE: (Co)Toni Lyles Drakeford, (75), tmd89tmd@aol.com .